My husband loves pickled beets and while covering the Illinois Products Expo for Farm World he came to a dead stop in front of Gramp’s Gourmet Pickles and got in line for a taste. 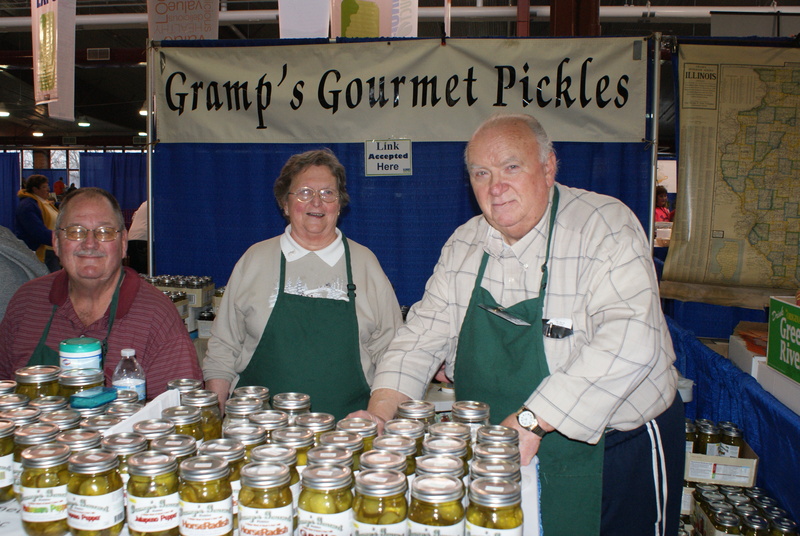 Bill “Gramps” and Janet “Grams” are the force behind Gramp’s Gourmet Pickles which is located in Scales Mound, Illinois. “He makes them and I can them” Janet Brickner said after serving up a sample to my husband that carted home a can of both beets and sweet pickles. “Our best sellers are our pickled beets and our original sweet and sourdough garlic pickles,” Brickner added. The business began when Bill “Gramp’s” Brickner started making pickles and beets for fun and giving them as presents to clients, family and friends at Christmas time and other occasions. They became so popular that he began to o sell them at a local Farmers Market and in 2005 the Brickners started Gramp’s Gourmet Foods. To find out how to get some cans of your own, log onto their website at http://www.grampsgourmetfoods.com for more information.